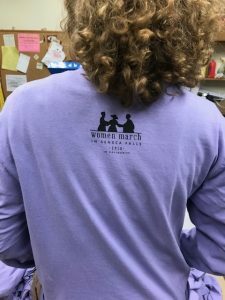 IF YOU MISSED Women March in Seneca Falls 2019, we still have a limited number of shirts available. OR Click Here to place your order to have it mailed to you. Don’t forget to order your 2019 March Button too! 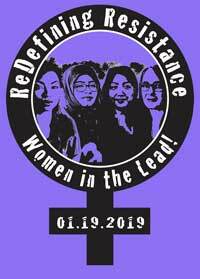 Women March in Seneca Falls 2019 is offering commemorative ReDefining Resistance – Women In The Lead! 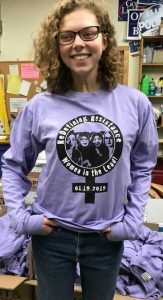 long sleeve t-shirts in a light purple color for only $19 (as in the 19th amendment). ALSO the Women March in Seneca Falls logo is on the back! This two color design is printed on a super soft 100% pigment-dyed ring spun cotton long sleeve unisex t-shirt.